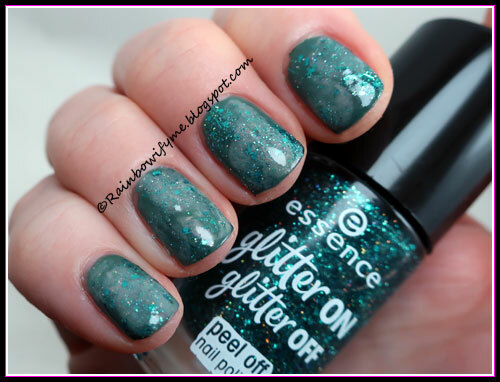 Rainbowify Me ~ Nail blog: Essence ~ Glitter in the Air! Essence ~ Glitter in the Air! 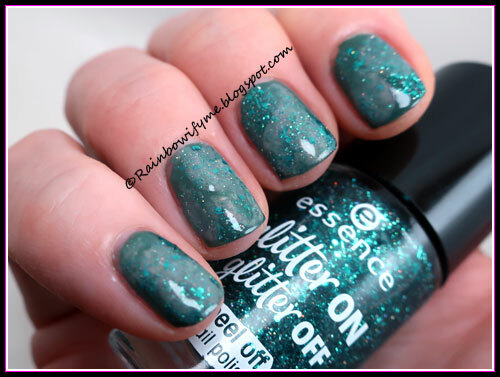 “Glitter in the Air!” is from Essense’s “Glitter On Glitter Off”-collection just like “Spotlight On!” that I showed you yesterday. Today I decided to use my peel off-glitter for nail art. I started out with two easy coats of Sephora’s “Tribal Tattoo”. Then I dripped a bit of “Tribal Tattoo”, a bit of Essence’s “Glitter in the Air” and Artistic Colour Revolution’s “Under the Overalls” on a piece of plastic. Then I dipped my sponge in the mix and sponged it onto my nails. When that was all dry I topped it with topcoat and my manicure was done. The grey gives the manicure a bit of a cloudy look. I think it would have looked really nice with white as well. 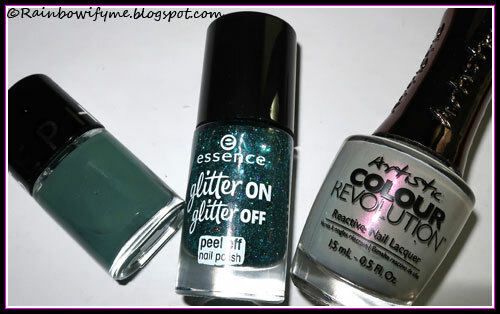 These are the three polishes I used today. Number of coats: I used it for nail art. What a precious effect sweetie!! !